Awhile back, I'd started using Evernote to organize my stamp sets. I posted about that on the blog here, if you're interested in checking that out. 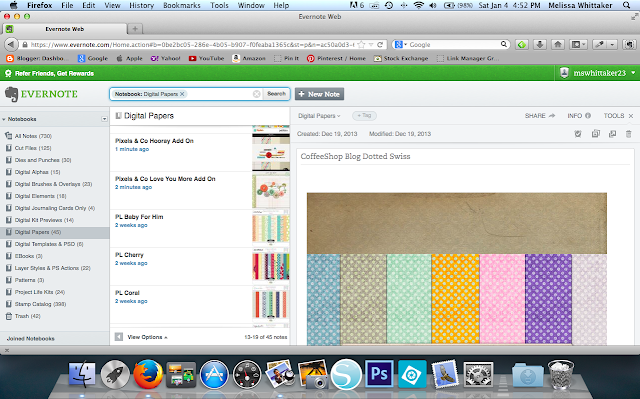 I still don't know the full capabilities of Evernote, but I've found it incredibly helpful in keeping track of my stash. It started with my stamp sets, of course, but a few months ago I realized I could also use it to keep track of my Project Life kits. 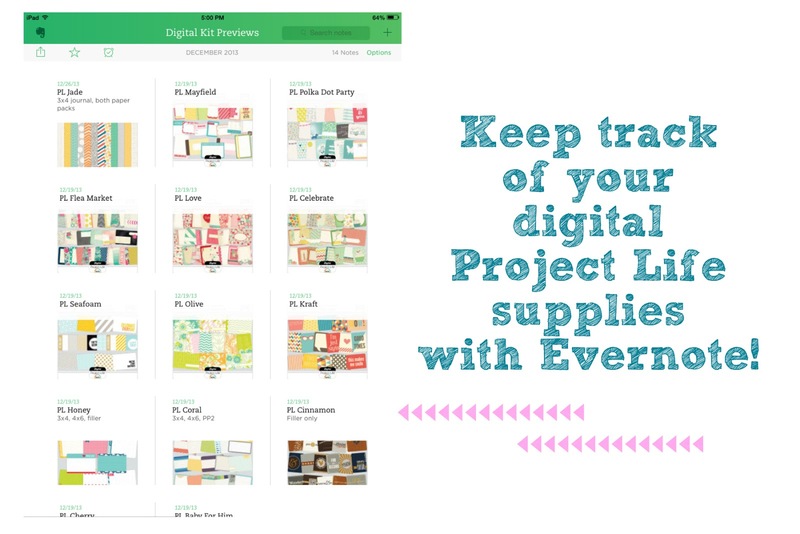 At first, I just added the preview images from the Digital Project Life site for the kits I owned, but once Becky started releasing the PDF reference sheets, I added those PDFs right to Evernote. What is AWESOME about Evernote is that it works over multiple systems - computer, iPhone, iPad, Android...so you can have your supplies on the go. Think: take a photo of all your paper stacks so when you're at Michaels you don't buy the same one twice. (I've totally never done that). 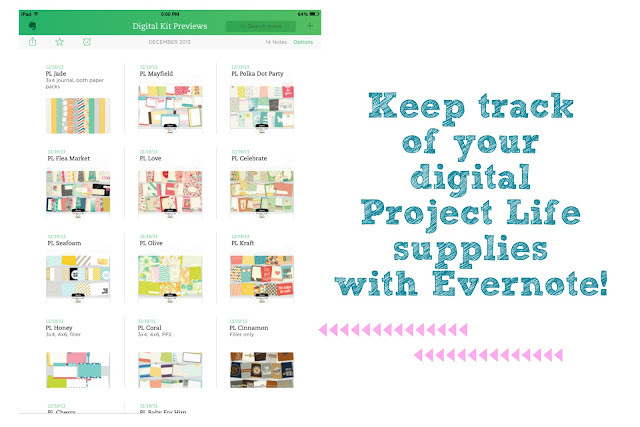 In 2014, I'm switching to Project Life in the digital format, and with that comes a boat load of supplies I need to keep track of. I'm talking digital kits, papers, elements, brushes, overlays, you name it. 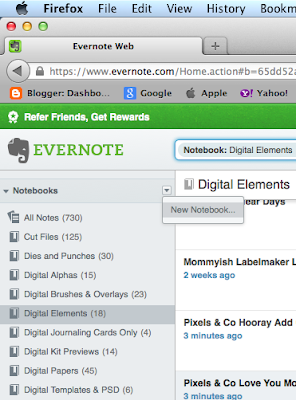 So I'm using Evernote, and I thought I'd show you how to do this so you can use it too. Evernote is free for their basic account, but if you're uploading a ton of photos at once (such as importing all of your stash to start off), you can pay $4.99 a month for their premium service which gives you a larger upload allowance. You can view your upload amount so you can see if you're getting close to the limit before you just go ahead and pay for the premium feature. There's no commitment, so I'm just paying for a few months until I get everything in there. And I purchased it through the app, so it automatically comes out through my iTunes account. Once I have my stash and only add a few items here and there, I don't need the premium account and can cancel. (I have done this before - when I uploaded my stamp sets I paid for one month and cancelled. It's very easy). 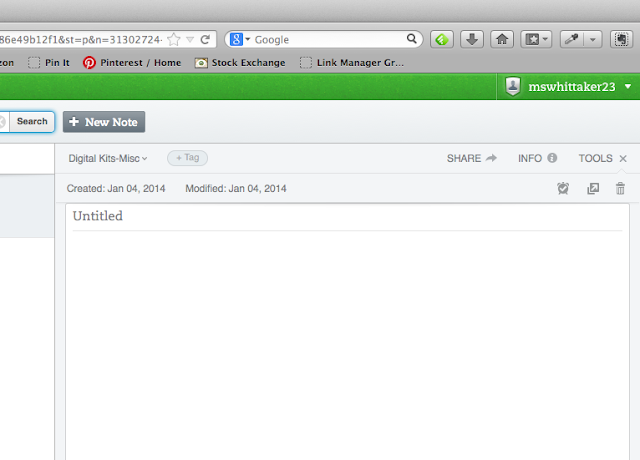 Let's start with what my Evernote account looks like when I log in right now. This is a work in progress, as I still have a lot of elements to add. You can see I have my Stamp Catalog at the bottom, where I keep an image of all of my stamp sets and individual stamps. I have them tagged by occasion or use. I even keep track of all my Photoshop layer styles with Evernote, which is handy when I want to create a digital element of my own. Within each notebook, you have "notes." The best way for organizing for me has been to have a specific notebook (like, digital papers) instead of a generic one (like, Project Life). You'll see why as I show you how I organize. To make a new notebook is simple, just click the little arrow next to the word "notebooks" and click on "new notebook." You can name it what you like. In this example, I'm starting a new notebook for my miscellaneous digital kits (meaning, kits that are not solely Project Life kits). I called it "Digital Kits-Misc." Then within these notebooks, you'll create notes. Click on "new note" and name it appropriately. I'm working on my naming convention but generally I will put the designer and/or website something was purchased from, along with the name of the kit/item. Here I'm adding the Pebbles Seen & Noted kit. You can add an image to the note by clicking on the little paperclip in the toolbar within the note. I generally use the preview image for the kit. If it doesn't come inside the kit when you buy it, you can usually save down the one from the website. You can also tag the notes, which is helpful because if you use a tag that works for several notes in several notebooks, it will pull ALL of them when you click/search for that tag. Below I've tagged htis kit with "label," "project life," and "tabs." (I might add more later, but am just using this for an example for now). You could tag the kits with the colors they contain, or the type of elements, as I have with "labels." So what is nice is when you click on a tag, you'll get everything that you've tagged with it. Below, I am clicking on the "cork" tag, which is pulling my cork elements from my "digital elements" notebook, and my cork alpha from my "digital alphas" notebook. 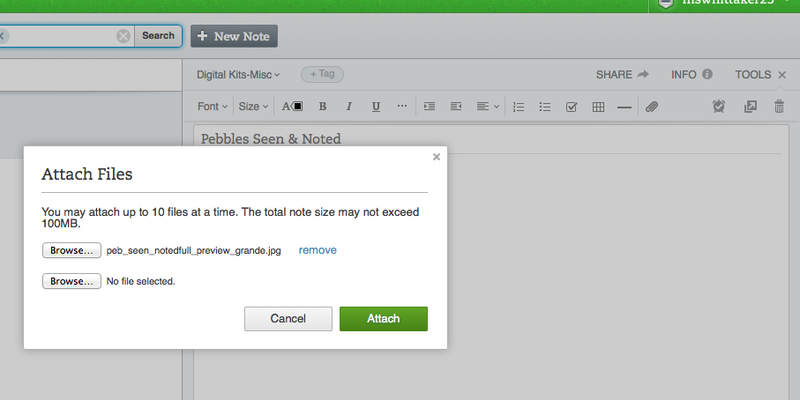 It is super easy to add notes and your images, but of course it'll take a little bit of time if you have a large stash. Once you've got your stash uploaded though, it doesn't take much time at all to add a new supply when you buy it. So I tend to upload through the website, since I would probably have all of my preview images saved there, but when I'm looking through my stash, I flip around on my iPad mini. 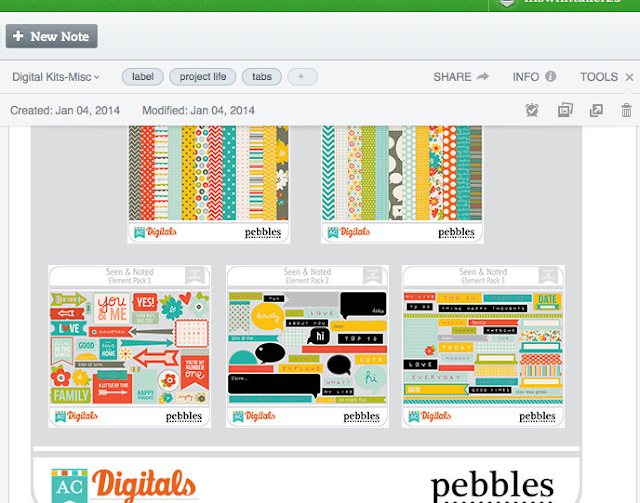 Here's what it looks like on the screen when I am looking at my digital Project Life kit previews. Remember above when I mentioned that I like to name a notebook more specific vs. a generic "Project Life" category? I do it this way because I create individual notes for the kits, or elements, or brush sets, etc. This way, when I pull up the "digital kit previews" notebook as in the example above, I can see EACH kit on the screen. If I were to create a "Project Life" notebook, then a "brushes" note within that and put all my brushes images in one note, only the first image would show. I much prefer the ability to see all my individual items at a glance, rather than having to scroll inside each note (because you CAN put more than one image within a note). So below, I'm on the iPad mini, and I clicked on that "cork" tag. It pulls up all the cork-related items, just as before. 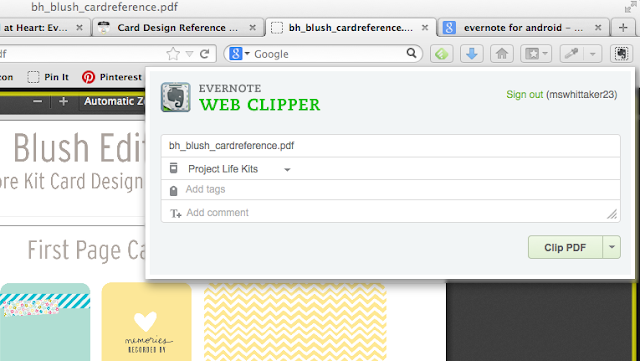 One final thing I wanted to show you was how to clip a PDF to Evernote. Evernote has this neat little web clipper that you install in your browser tool bar (think like the Pin It button). But it's SO easy. Then you can go in Evernote and view it. On my iPad I can open up the PDF in the PDF viewer to flip through. So easy. Hopefully I explained this clearly enough for you to get started, if you're interested. Though I'm showing you this for mostly digital supplies, you don't need to limit yourself that way. 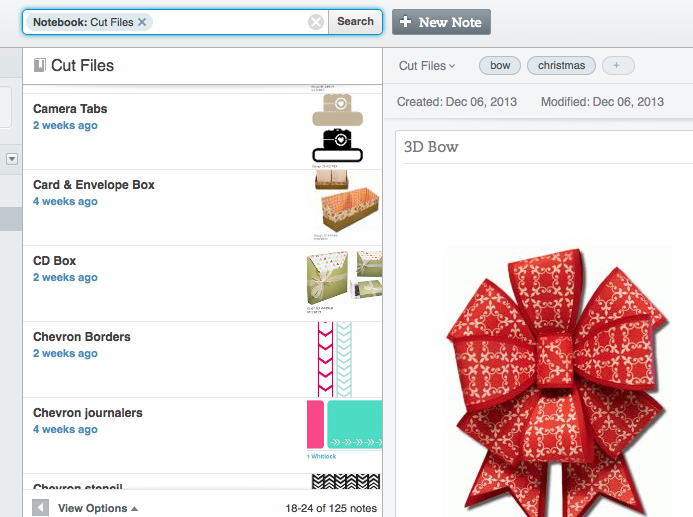 For your paper core kits you can still use the preview images and reference PDFs to keep track. You can photograph embellishments if you wish, or paper stacks, you name it. Use Evernote however you think you might get the best benefit. For me that's specific, categorized notebooks with individual images as their own note, so I can see all my stash at once. You can't right click to save an image on the Silhouette site, unfortunately, so I just take a screenshot. (On a mac that's shift, command, and the 4 key all at once, then select the area you want to capture. I tag all of these as well (Christmas, Project Life, Organization, etc). 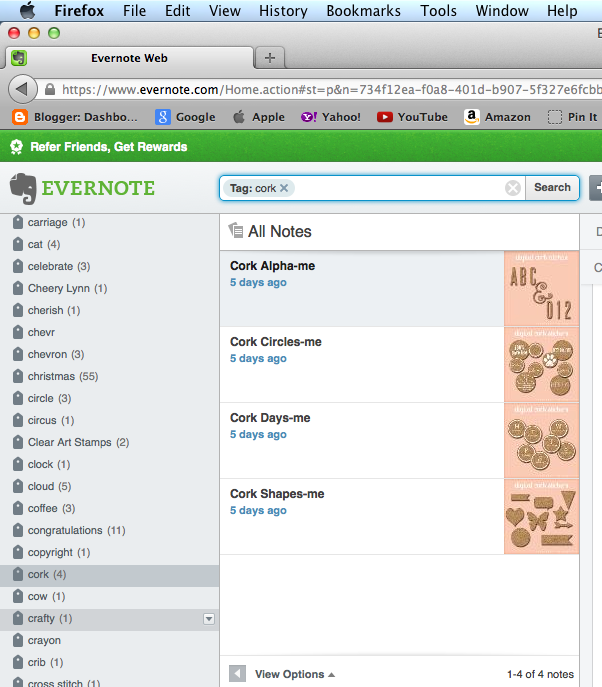 So that's how I organize using Evernote. Now, go try it for yourself! I am so glad you posted this today! I just updated my Evernote yesterday with some new stamp sets I have and was going to post on my blog about how great an idea this was. I couldn't remember where I'd seen the idea. And it was YOU! I love it. I have been guilty of buying sets again (!) and now when I'm out and about I can look before buying! I also have listings of my distress inks, Hero Arts inks, etc. So helpful!! 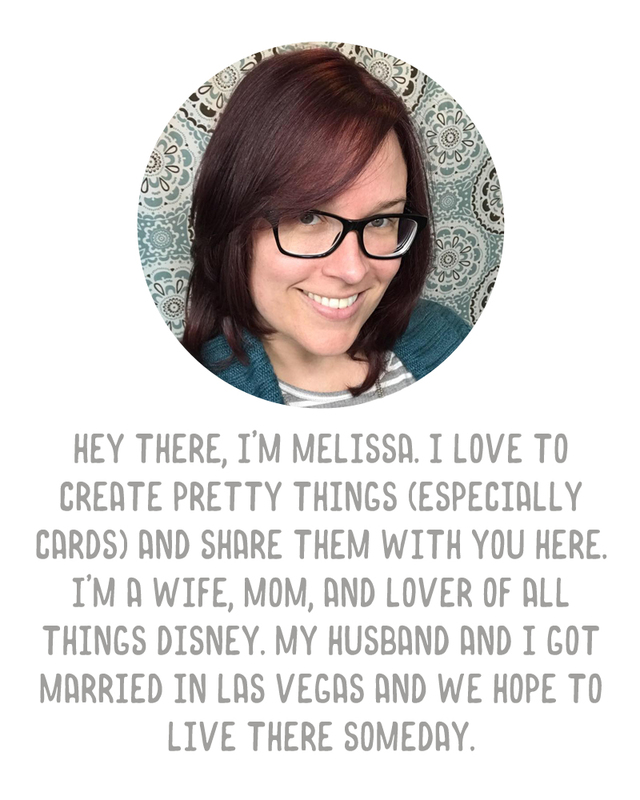 I am also going to make the leap from physical Project Life to digital. I think it will be a faster process for me. I'll be checking in to see how you're doing! Love the tutorial!! Thank you!! This may be just what I need to be able to keep all my PL stuff "straight" in my brain!